Mmmmmmm dribbling at my work desk! Might give this ago… although I have a nice little risotto set at home I can never be bothered with making one! Will give this a go soon! I am all for the beer cooking though my only post is http://thehalfpintgentleman.com/2013/12/08/oscar-wilde-mild-beefy-goodness/ my instructions and measurements are a bit more Jamie Oliver and bung it all together haha! My Holy Cowbell-bacon-and-courgette-spiced-with-cumin risotto worked pretty well actually. The fear that it could be too hoppy for a risotto (leading to unwanted bitterness) with was dispelled when I had a taste of it beforehand. 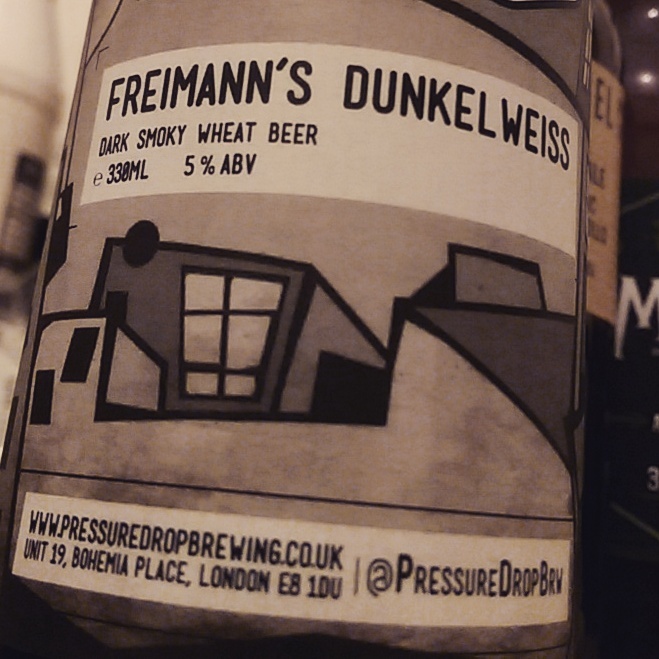 We perceive it as, potentially, being ‘too hoppy’ purely because it is actually hoppy for the style (if we are calling the style ‘stout’), but in fact it isn’t all that bitter. 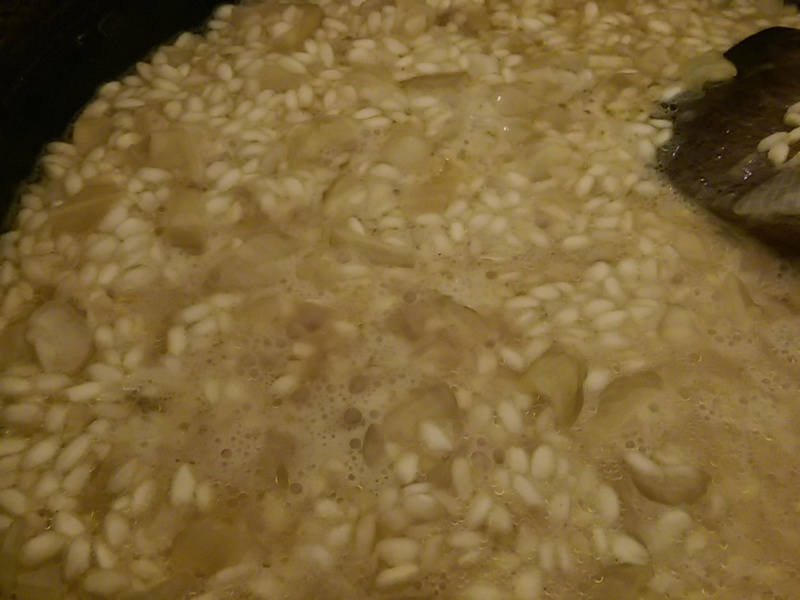 Anyway… it contributed a very pleasant dry roast flavour and sensation to the risotto. Definitely worked for me. I paired mine with Black Betty, roast with roast, plus the smoke of the bacon = win. On that note, I think that even Black Betty _might_ work because although it has more bitterness it also has a fantastic savoury caramel (like you get from a properly caramelised steak) in its flavour profile. It would depend what meat you wanted to use, maybe some pork which has undergone some caramelisation. And on a risotto (with or without beer) note, I always cook whatever meat I am using _before_ I start with the onion and garlic because then you have pre-existing flavour in the pan. So in this case I fried the bacon then removed it to a bowl to add back in at the end, resulting in plenty of bacon fat for softening the onion and garlic in. I love the versatility of a risotto. I’m definitely looking forward to more risotto with beer in the future. Glad the Holy Cowbell worked – it is *very* roasty as you say, so I can see how it would work nicely. I was going to do the bacon first and set it aside, but after I’d decided to do mushrooms, I decided to them together separately (mainly to improve mushrooms). If doing it without mushrooms then yeah I would probably do bacon first to have flavoured fat. I normally do that for carbonara etc. making things taste of bacon is fun AND important. As for Black Betty – great call I think. Like you say, that caramelised steak sticky sweetness is a great flavour to have in there. I reckon it could go nicely if you used Chinese char siu pork perhaps? So much deliciousness to ponder.